The effects of material structure on the electrochemical performance of mangrove-derived hard carbon anodes in sodium ion batteries were closely examined. The size and distribution of micropores were controlled by adjusting the preheating step that chars green wood. The electrochemical properties of mangrove-derived hard carbon were significantly improved by optimizing the preheating conditions. Optimal performance, in terms of discharge capacity and first-cycle Coulombic efficiency, was observed following 7 days of preheating at 500 °C. We also examined the influence of ultra-micropore structure on the electrochemical properties of mangrove-derived anodes in SIBs. Sodium ion batteries (SIBs) are a promising alternative to lithium ion batteries (LIBs) due to the similar chemical properties of sodium and lithium and the natural abundance and relatively low cost of sodium . Whereas typical anode materials used in LIBs, such as graphite, are not suitable for use in SIBs, hard carbon anodes have shown a reversible capacity of approximately 300 mAh g−1 . In addition, hard carbon can be derived from renewable biomass sources such as sugar [3, 4], cotton wool , pinecone hulls , peanut shells , and rice husks . In recent years, mangrove-derived char has attracted attention as an effective raw material for hard carbon production due to its relatively high abundance and low cost. The total world area of mangrove forests in the year 2000 was 137,760 km2, including 118 countries and territories in the tropics and subtropics . The largest expanses of mangroves are in Asia (42%), particularly Indonesia (23%), followed by Africa (20%), North and Central America (15%), Oceania (12%), and South America (11%) . In a previous study, we found that hard carbon derived from mangrove char and carbonized under vacuum exhibited higher discharge capacities and reversibility than chars carbonized in an argon atmosphere . To increase the yield and initial Coulombic efficiency of SIBs, we developed an additional preheating step in the preparation of mangrove char. This step allowed a greater degree of control over the final electrochemical properties of the resulting hard carbon . Preheating green mangrove wood increased the fixed carbon yield and enabled control of pore size and the distribution and amounts of oxygen-containing functional groups in the final product. 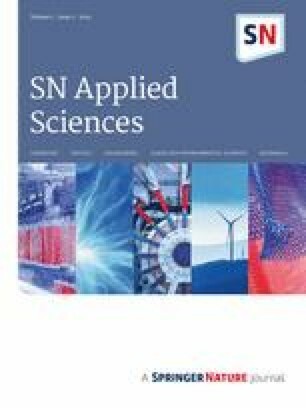 Although sub-nanometer voids or defects in hard carbon have been considered as promising storage sites for sodium ions in SIBs, the relationships between the structure of the hard carbon and the electrochemical performance, such as discharge capacity, first-cycle Coulombic efficiency, cycle ability, and rate performance, remain unclear. In this study, we incorporated mangrove-derived hard carbon as an anode material in SIBs, using the preheating step developed in our previous work. 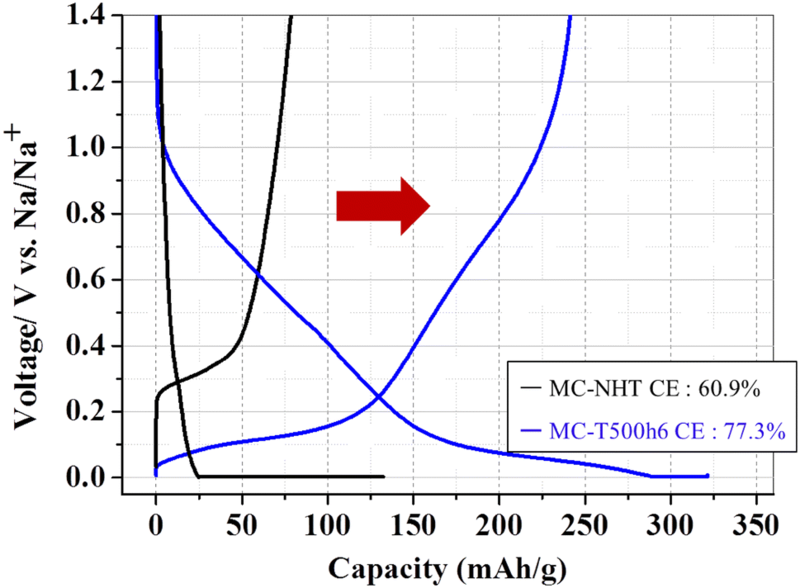 We closely examined the experimental conditions during char preparation and showed how these parameters can be adjusted to control the final structure of hard carbon as a means of improving the electrochemical performance of SIB systems. The conditions during preheating were particularly important in determining the electrochemical properties of the obtained hard carbon. To fabricate mangrove char, green Indonesian mangrove wood (Rhizophora apiculata) was heat-treated for 1–10 days in a bomb reactor with an inner gas pressure of 0.7 MPa. The reactor consisted of a stainless steel tube held at temperatures from 450 to 550 °C (heating rate: 5 °C min−1). The green wood was first heated in air from room temperature to 340 °C. The pressure in the reactor was then brought to 0.7 MPa and heating was continued until the desired temperature had been reached. The reactor pressure was adjusted by releasing gas during heat treatment using a control valve on the reactor tube. The temperature of heat treatment, from 450 to 550 °C, was also evaluated at 0.7 MPa for 1 day in terms of its effect on anodic performance. After grinding the char into 45-μm particles, all samples were heated at 800 °C (heating rate: 5 °C min−1) for 30 min in an argon atmosphere (Ar flow: 200 mL min−1) to remove any volatile components from the ground char. Hard carbon was prepared from the char samples by carbonizing at 1000 °C (heating rate: 15 °C min−1) for 1 h under vacuum (30 Pa). The relative weight loss from the green mangrove was determined by thermogravimetry (TG, EXSTAR6000; SII NanoTechnology). A dried sample of green mangrove tree powder was held in an alumina pan and heated to 1000 °C at a heating rate of 5 °C min−1 under a flow of nitrogen gas (100 mL min−1). Carbon, hydrogen, and nitrogen content were determined using a CHN analyzer (MT-5; Yanagimoto CHN corder). Oxygen content (Odiff) was defined as the difference resulting from the subtraction of the sum of C, H, N, and ash from 100%. The structural properties of the resulting mangrove-derived hard carbon were characterized by X-ray diffraction (XRD) using a Rigaku X-ray diffractometer with a Cu Kα (λ = 0.15406 nm) source. Adsorption/desorption isotherms of N2 and CO2 at 77 K and 298 K, respectively, were determined with a Belsorp-Max-S from MicrotracBEL Corp. CO2 adsorption/desorption isotherms were obtained at low pressure (< 10 kPa) to determine the distribution of ultra-micropore size based on a DFT model. 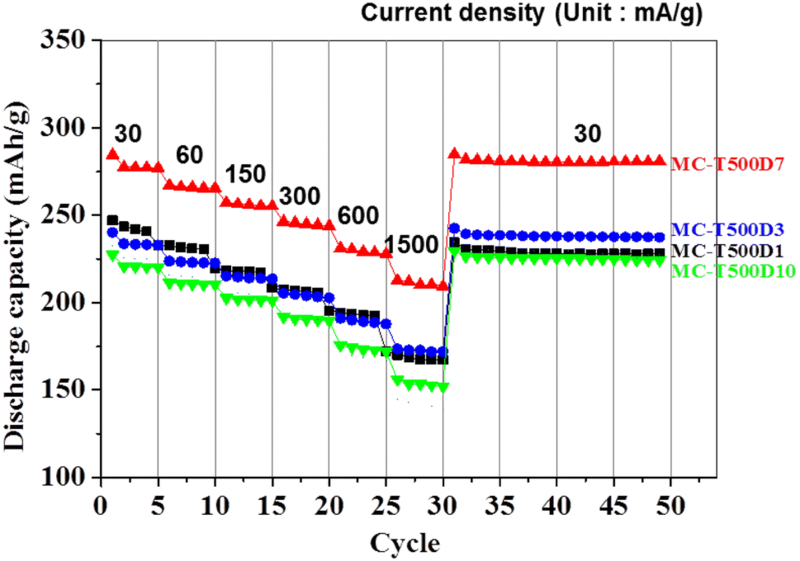 Electrochemical measurements were performed using CR2032 two-electrode coin cells. The electrodes were prepared by coating the mixed slurry, which consisted of 90 wt% active material, 5 wt% styrene butadiene rubber (SBR), and 5 wt% carboxymethyl cellulose (CMC) dissolved in distilled water, onto copper foil. Sodium metal foils were used as the counter and reference electrodes, and 1 M NaPF6 dissolved in propylene carbonate (PC) (Tomiyama Pure Chemical Industry) was used as the electrolyte. The assembled coin cells were first charged from open circuit voltage to 0.003 V versus Na/Na+ at a current density of 30 mA g−1, followed by constant voltage charging at 0.003 V until the current density decreased to 3 mA g−1 (Toscat-3100; Toyo System). Figure 1a shows a typical SEM micrograph of green mangrove wood. Several oriented structures are evident due to long growth time. These structures suggest that heat treatment would yield hard carbon with a high degree of carbonization. To confirm the effects of preheating, green mangrove wood was subjected to two different heat treatment methods. Non-preheated mangrove char (NP-MC) was heated directly from room temperature to 800 °C at 5 °C min−1. Preheated mangrove char (P-MC) was heated from room temperature to 500 °C at 0.7 MPa for 1 day, then heated to 800 °C. Figure 1b shows the mass yield of mangrove char. The NP-MC exhibited a much lower weight yield than the P-MC, which was 24.8%. The preheating of green mangrove wood increased the mass yield of char. 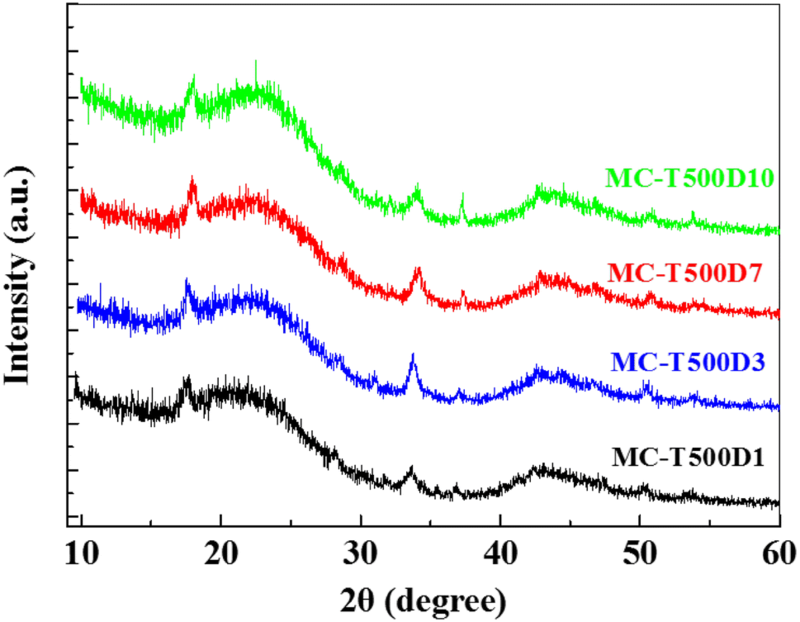 The physical characteristics of NP-MC and P-MC were investigated by XRD and Raman spectroscopy. The results are shown in Fig. 2a, b. The diffractogram of MC-NPT (mangrove-non preheat treatment) contained a very broad and weak peak near 26° with several small impurity peaks. 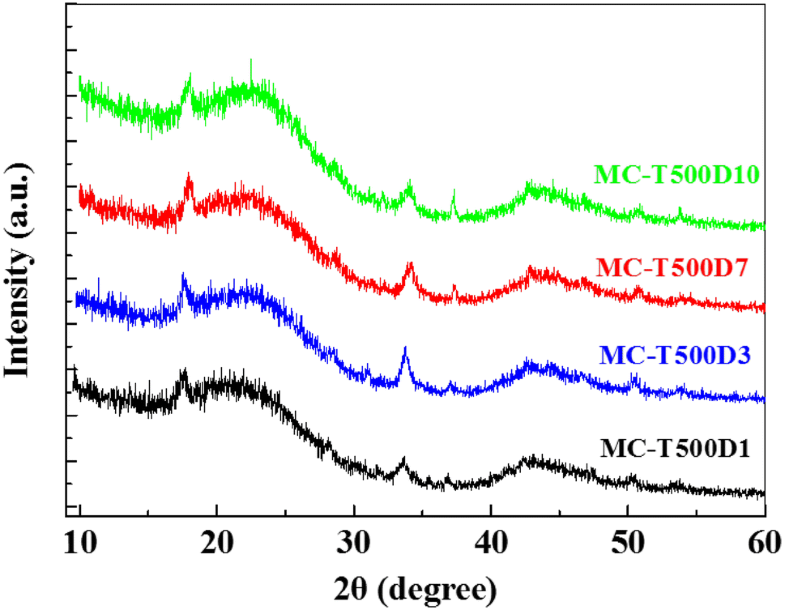 Despite several peaks corresponding to impurities, the preheated hard carbon (MC-T500h6) clearly showed a turbostratic carbon structure. Raman spectra yielded additional information on the structural properties of the hard carbon surface. In Fig. 2b, peaks corresponding to surface disorder and defects presented as a D-band at 1350 cm−1 and a G-band at 1590 cm−1, indicating a graphitic structure. The intensity ratio of the D-band and G-band (Id/Ig) of NP-MC was 1.02, much higher than that of MC-NPT (0.97). Thus, the degree of disorder in the hard carbon decreased with the addition of a preheating step. Generally, heating at approximately 500 °C induces a coking reaction that converts organic material to insoluble carbonaceous material through the formation of polyaromatic compounds and their partial cross-linking with sp3-hybridized carbon with heat dissipation. In such competitive and complex reactions, low-temperature preheating can lead to a synergistic effect on sp2 bond formation. This process also eliminates unnecessary volatiles and thereby enhances the relative proportion of organic bonds, resulting in high carbon yields [11, 12]. Figure 3 shows charge/discharge profiles of hard carbon samples obtained at a current density of 30 mA/g between 0.003 and 1.5 V versus Na/Na+. After preheating, the specific discharge capacity and the Coulombic efficiency were 250 mA/g and 77.3%, respectively. In particular, the specific discharge capacity of P-MC increased more than three-fold after preheating. This profile suggests that sodium ions were inserted directly into heat-treated hard carbon derived from mangrove char. Therefore, preheating significantly improves product yields and the electrochemical properties of hard carbon anodes. The influence of heat-treatment temperature was evaluated to identify the optimum conditions for char production from green mangrove wood. Figure 4 shows the first-charge/discharge profiles of as-prepared hard carbon samples made from chars prepared at 450–550 °C for 12 h. Compared to those heated at 450 °C and 550 °C, hard carbon from chars that had been preheated at 500 °C exhibited a relatively high first-cycle Coulombic efficiency of 77.3% and a specific discharge capacity of 249 mAh g−1. Thus, the optimal preheating temperature was 500 °C. This temperature yielded the best trade-off between volatile loss and the formation of organic bonds. Both discharge capacity and the first-cycle Coulombic efficiency improved with longer preheating stages. Figure 5 shows charge/discharge profiles at the first cycle of as-prepared hard carbons that were preheated at 500 °C and 0.7 MPa for 1–10 days. The hard carbon made from char that had been preheated for 7 days exhibited an 80.0% Coulombic efficiency and a specific discharge capacity of 284 mAh g−1. Both of these metrics decreased with longer heat treatments. This suggests that nanoporous and turbostratically disordered graphene sheet structures can change during long-term preheating. 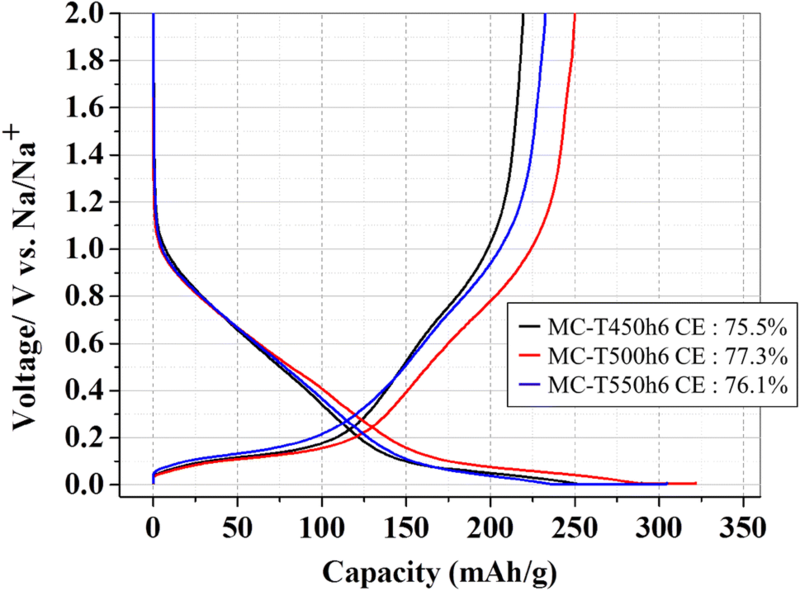 In particular, the first-cycle Coulombic efficiency of MC-T500D7 was significantly higher than those of the other samples. All samples exhibited similar charge processes, indicating similar amounts of electrolyte decomposition. Thus, preheating did not have a significant influence on the prevalence of side reactions during charging or discharging. Preheating did, however, affect the de-insertion of sodium ions from disordered graphene layers. Therefore, the best preheating conditions for preparing anode-suitable char from mangrove wood was 500 °C for 7 days. The rate performances of hard carbon samples derived from preheated mangrove chars are shown in Fig. 6 at discharge rates from 30 to 1500 mA g−1. The discharge capacity at each rate and the retention rate (1500 mA g−1/30 mA g−1) of the discharge capacity were calculated and are shown in Table 1. In all cases, due to the irreversibility of sodium ionization, discharge capacity decreased rapidly after the first cycle and then stabilized. As-prepared hard carbon showed greater discharge capacities at higher current rates with longer preheating durations up to 7 days. The highest rate performance showed a capacity of 210 mAh g−1 at 1500 mA g−1 and a retention rate of 75.5%. MC-T500D7, the hard carbon sample that had been preheated at 500 °C for 7 days, yielded a disordered carbon layer that might be well-suited to sodium ion insertion and de-insertion. The electrochemical performance of any given hard carbon sample depended largely on its structural properties. Therefore, the structural properties of hard carbons derived from mangrove wood that had been preheated for different durations were investigated by XRD and adsorption/desorption isotherm analyses. Figure 7 shows XRD diffractograms of hard carbon samples prepared under a variety of fabrication conditions. All samples yielded a broad and weak diffraction peak at approximately 2θ = 24° and 43°, corresponding to the (002) and (100) planes, respectively, which are characteristic of low degrees of graphitization and turbostratically disordered structures. The interlayer distance between graphitic layers in our hard carbon samples was calculated to be 0.37–0.38 nm. As carbonization temperature increased, the (002) peak shifted to higher diffraction angles, corresponding to a decrease in interlayer spacing. The peaks around 2θ = 18° and 29° increased markedly at higher carbonization temperatures and longer heating durations, indicating the existence of Ca(OH)2. Nitrogen adsorption/desorption isotherms at 77 K are shown in Fig. 8 for mangrove char-derived hard carbons made with various preheating durations. 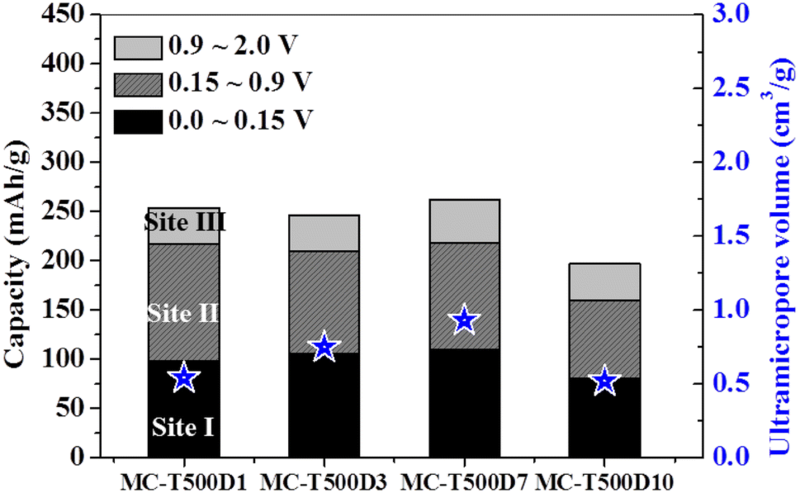 The specific surface areas of samples MC-T500D1 to D10 were 3.6, 5.2, 6.8, and 4.3 m2 g−1, respectively. Such low surface areas are not compatible with the observed charge capacities of these materials and the insertion of sodium ions. Therefore, nitrogen adsorption/desorption isotherms failed to detect the pores in these materials. Figure 9 shows the CO2 adsorption/desorption isotherms and the corresponding pore size distributions obtained using NLDFT (non localized density functional theory) methods on our prepared hard carbons. The pore diameter in mangrove char-derived hard carbons was distributed primarily between 0.45 and 0.55 nm, which can be referred to as ultra-micropores. The average ultra-micropore diameter increased with the duration of preheating. In our previous study, we suggested that the existence of suitably sized ultra-micropores in the anode material improves the electrochemical performance of LIBs . 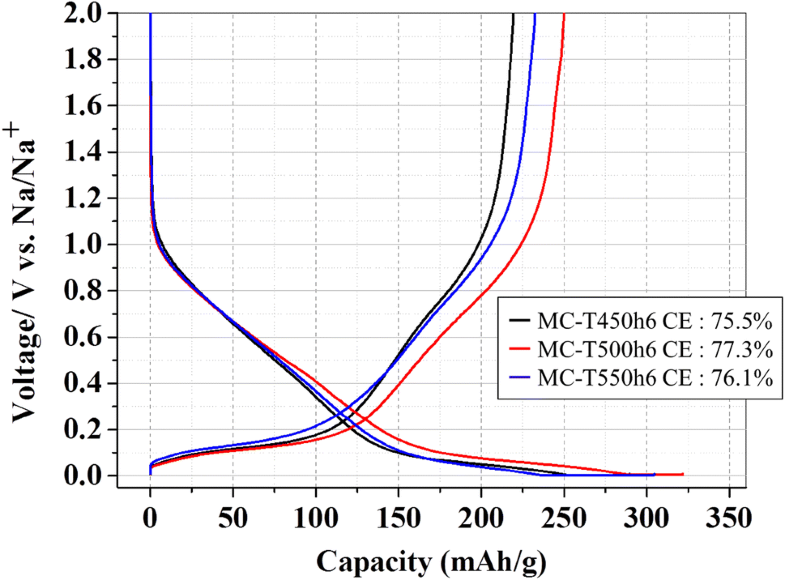 Optimal electrochemical properties were observed with sample MC-T500D7. It can therefore be presumed that ultra-micropores, formed in hard carbons that have been preheated at 500 °C for 7 days, provide a good environment for the insertion and de-insertion of sodium. The relationship between the discharge capacity in the first charge cycle and ultra-micropore volume is shown in Fig. 10. Individual discharge capacities for Sites I–III are given Table 2. Previous researchers have suggested that the discharge capacity of hard carbon can be divided into three regions. Region 1 (below 0.15 V) is a discharge plateau that is believed to reflect the filling of pores (named Site I) by sodium metal (nanopore filling). Region 2 (below 0.9 V) is due to the intercalation of Na between turbostratically disordered graphene sheets (Site II). Region 3 is a discharge plateau at around 1.3 V, wherein Na is covalently bonded to edge sites on the graphene layer, especially in the vicinity of hydrogen atoms. These are considered storage sites (Site III) . Significant discharge capacity corresponds to the low voltage region, and it has been suggested that this low-voltage plateau is related to the filling of pores with sodium ions. Figure 10 shows that the discharge capacity of Site I is directly correlated with ultra-micropore volume. We therefore believe that these ultra-micropores have a significant effect on the reversible sodium ion storage sites in hard carbon. A preheating process was developed to prepare hard carbon from mangrove wood for use as an anode material in SIBs. The optimum preheating conditions for the preparation of mangrove char were 7 days at 500 °C in a 0.7-MPa atmosphere. 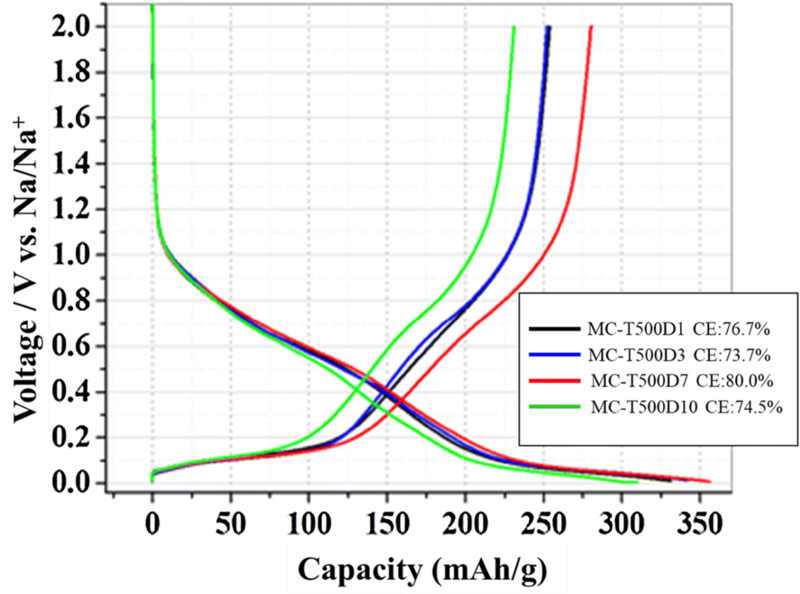 Hard carbon that had been treated in this way exhibited a sustained rate capability and a discharge capacity and first-cycle Coulombic efficiency of 284 mAh g−1 and 80.0%, respectively. Pre-heating conditions were shown to control the pore structure in the resulting hard carbon. Ultra-micropores were shown to play a role in the formation of reversible ion storage sites for sodium ions. This work was partially supported by the Korea Institute of Chemical Technology (KRICT).